Yes, it's a little early for Valentine's Day, but I love having little "lovey" cards around to sneak into my hubby's bag when he goes away for work. Thankfully that doesn't happen often, but I like to surprise him when he does! Thanks to Melanie, I am using her great idea to use some pre-made tags to put together quick cards. I have bunches of tags from swaps that are just sitting there in my craft room, and I am not using them, so I will be sharing several cards (most of them pretty quick and simple) with some of the tags. This tag was really neat in that I think it was made out of paint chips! I used the sketch from Cardabilities December 30 challenge. 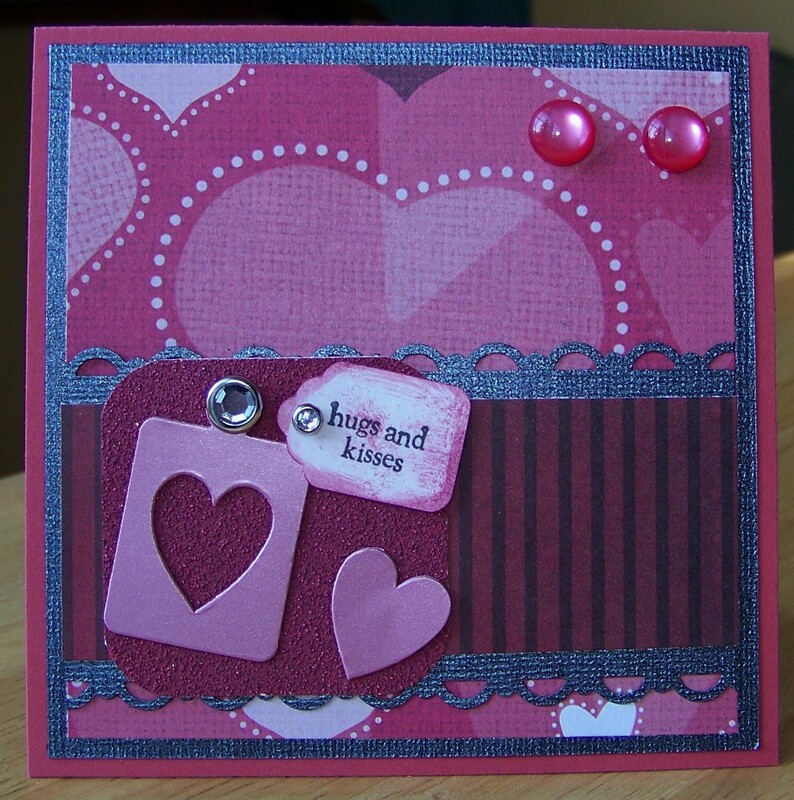 Supplies are cardstock from DCWV and SU Ruby Red. I used a SU border punch, and some jewels from my stash. DP is also DCWV I had in my scraps. Such a cute card! I can't even think about February right now LOL! Great way to use up some swap stuff! I am with Nancy I cant think February yet I am still thinking about Christmas and mailing stuff off,it has flown by too fast. But I love your card and I know hubby will too:)Great job and really pretty Patterns papers. This is adorable Colleen! Love the little tag & heart paper. It's great to have quick cards like this on hand just because! Definitely have to have a look in my stash of stuff to use up and make up some cards!